As I recently posted a review of one of my favourite two-player abstract games (Hive), I thought it would be a good idea to dust off this old review, which first appeared on www.BoardGameGeek.com back in September 2008. Note that this game is not out of production, and is readily available online and in good game stores. Full disclosure: I love Fox & Geese. I love it, but unfortunately, I just don't seem to be able to find anybody else who does. But why not? This is an old game (apparently vikings used to like playing it in between a good bit of pillaging), but Chess is an old game, and I'm never short of someone for a game of Chess. So, perhaps it is because it is a two-player game in which each player has a different set of pieces and different objectives... Hmm, no, that's not that unusual either. I guess that means it must be because it is REALLY REALLY REALLY, and I mean REALLY, hard to win as the stupid bird-brained geese who, despite the presence of a fox, REFUSE TO FLY AWAY! 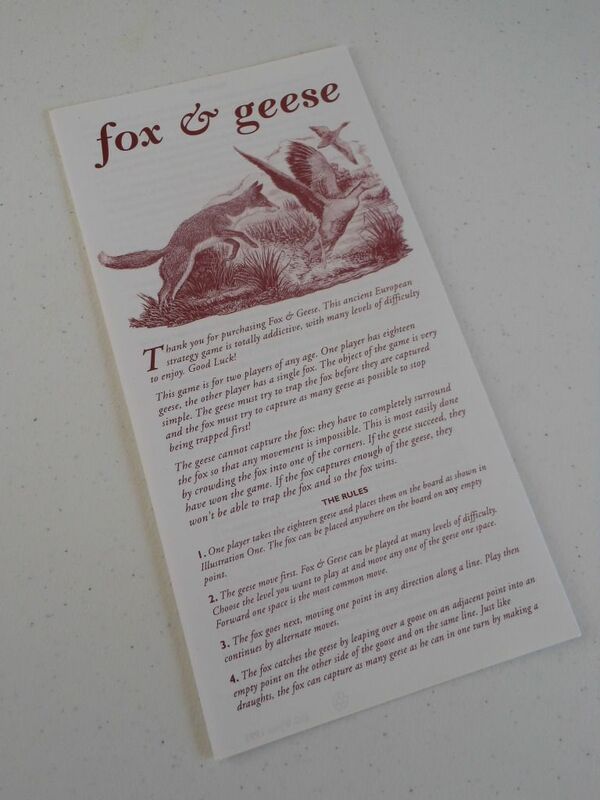 But I'll back up a little and start at the beginning... For this review I will be discussing my brand spangly new edition of Fox and Geese, as brought to you by English company The Green Board Game Co. I got this copy as a gift one Christmas from my brother, who honestly couldn't believe I had heard of the game. Can it be my own family doesn't realise I'm a geek? So I excitedly cracked into the rather large box the game came in, wondering what on earth could be inside to warrant such a luxurious size. As it turns out, absolutely nothing. The box is the size it is so that the board could be created with just one fold, rather than being sliced and folded into quarters. This is actually quite annoying, because TWO THIRDS of the box is COMPLETELY EMPTY and does nothing except take up space on my shelf! The wooden fox piece and the 18 wooden geese (which are quite cute and actually look like animals rather than generic wooden pieces) sit in a little central compartment in the box. The only other contents are the instructions (which come in five flavours: Dutch, German, English, French, and Spanish). The box for Fox & Geese is about three times the size it needs to be. Apart from the annoying amount of empty box, I can't complain too much about the components. The pieces are well crafted (although perhaps a little unstable when standing on the board) and the instructions are very clear and straightforward, including all the rules and several game variants to make it harder or easier for each player. The rules are clearly written, but make the game look a little drab. Enough about the bits, especially as I am sure there are plenty of different versions of this game about, and each one will be of different quality. Time to talk about the game. 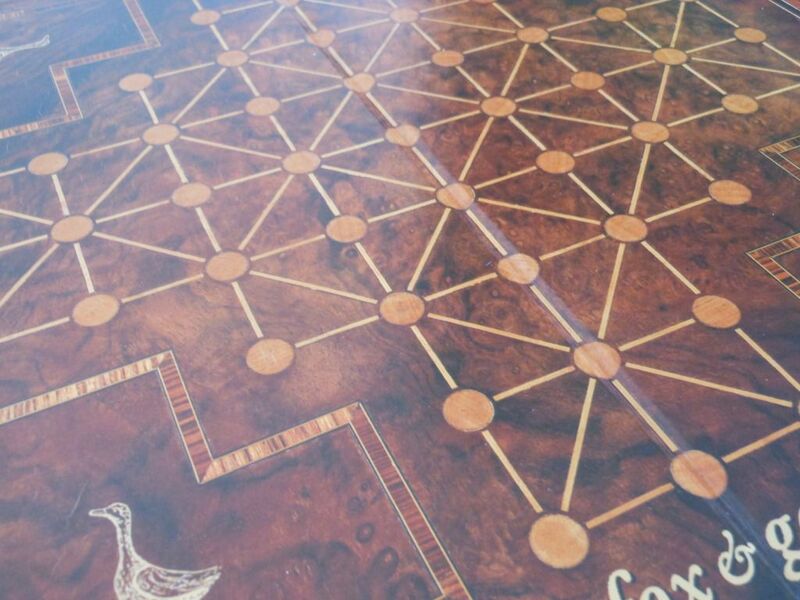 For those of you who don't know, here's a brief rundown: The game is played on a cross-shaped board. On some spaces it is possible to move in eight different directions, in other spaces, it is only possible to move four (i.e. you cannot move diagonally from some spaces). This little detail is of great significance, because the geese really don't stand a chance unless they make use of it. 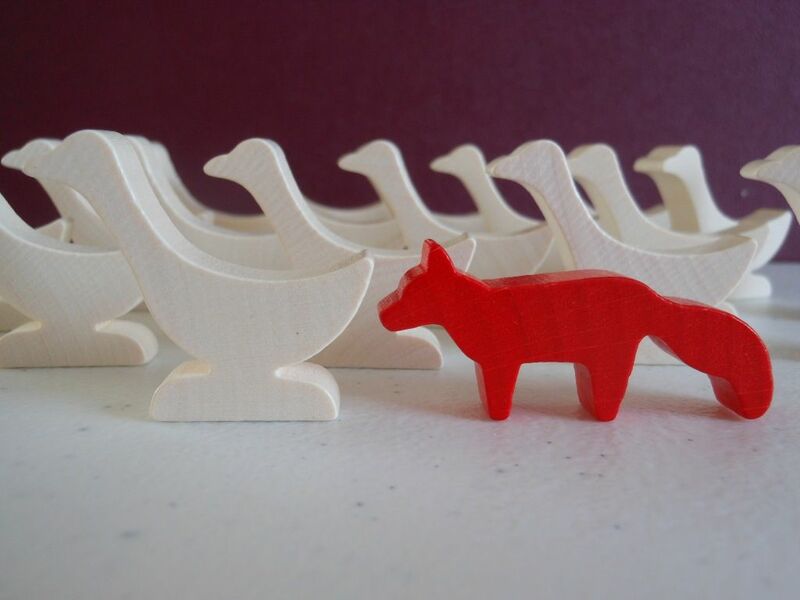 The geese start bunched together at one end of the board, the fox starts where-ever he wants. 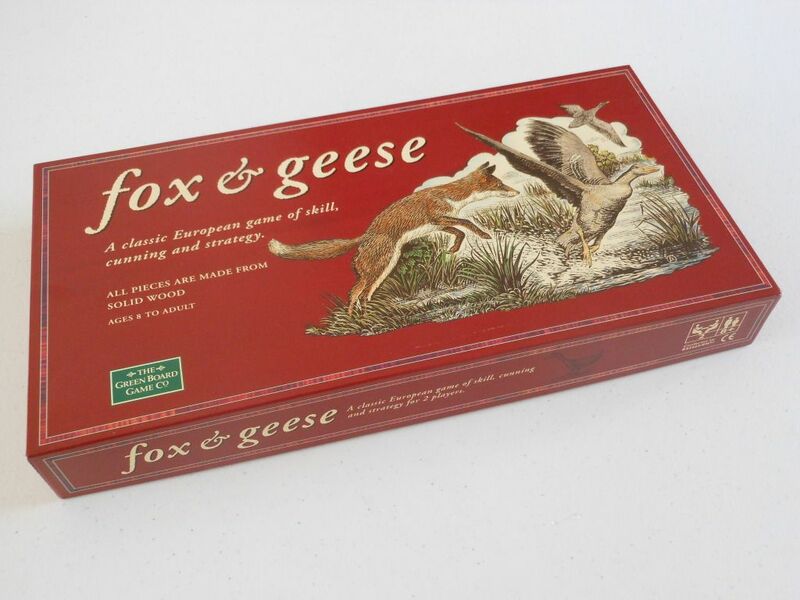 Play then proceeds in turns, with the fox moving every time ONE goose moves. Details of the board, showing the movement paths. The aim of the game depends on which side you are playing. The fox is trying to eat enough geese to make sure he can't be caught. He does this by leaping over any adjacent goose into an empty space on the other side of the goose (obviously he cannot do this if there are two geese in a row, so it is important to make sure geese are not left stranded). However, the fox is a nasty sod, and he captures like a draughtsman - if he leaps over a goose into an empty space, and there is another viable target, he can immediately leap again. He can keep on in this manner until he can't catch any more geese. The geese win the game if they can force the fox into a position from which he has no viable escape route (i.e. no clear spaces, and no geese that can be jumped over). This sounds quite easy, after all, there are 18 geese and only one fox, but when you are moving only one goose at a time it can be a real pain to make a decisive enough attack to snare the fox successfully. I think this is probably why a lot of people don't like this game as much as me. The geese tend to lose most of the time (I have bagged a few wins, but not many!). Of course, the game is normally over in less than 10 minutes, so you can reverse roles and have another go, but generally speaking, the player with the geese sits down with a sense of "Oh well, I wonder how quickly I lose this time." It tends to put people off playing. If you play twice, and the fox wins both times, then you end up having to determine who was the overall winner by who lost the least amount of geese (who was the best loser, so to speak). For some people, this review may have reminded them of a different game: Thud (which I will review another day). In that game, trolls and dwarfs are battling for supremacy of a battlefield. Dwarfs have to team up to take down trolls, but trolls can just smash dwarfs to bits single-handedly. I love Thud too, but it suffers from the same problem: You really have to play twice, and the overall winner is determined to be the player who put up the best fight as the dwarfs. So overall, I think this game is a great little brain-burner. It plays fast and dirty (you could easily get six games into your lunch break) and there isn't that much room for analysis paralysis (come on, you are moving one piece one space, just jump over the flipping goose already!!!) It is far more accessible than chess, and from opening the box, you can know all the rules and be playing your first game within five minutes. I also like the fact that each player has a different set of challenges to overcome. I like playing as the geese (especially if I pull off a rare win). I like to know that even though the game is incredibly simple, I am going to be really challenged. If I win, it is a massive sense of accomplishment. However, I do fully understand why some people do not like the prospect of playing the geese. Oh, and as an added little bonus, The Green Board Game Co use recycled materials and wood from managed forests, so I don't feel quite so bad about that gigantic box. On the downside, you may get fed up seeing the fox win every game. 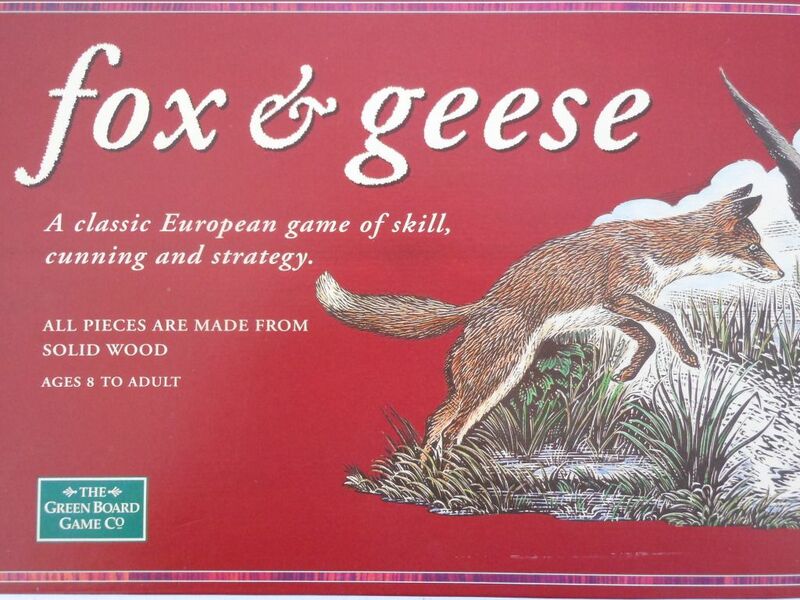 Also, some people may not approve of a game in which a fox is trying to chow-down on geese; but this game was invented in a time when hairy folk were burning down each others houses and sticking pointy stuff where it was never meant to go. The theme could have been worse! A cat among the pigeons? There's not really anything else I can add. If you are prepared to accept each player has a different role in the game, then there is plenty to enjoy here, although I very much doubt it is the sort of game that will be many people's first choice. Hey - give it a try, and if you like it, let me know that I'm not alone in the world!! You should look into tafl or tablut - asymmetric custodial capture games, also of Viking origin. Hi - thanks for the recommendations. I was aware of them, but I've never given them a shot. I believe Thud!, which I will be reviewing soon, tips its hat to Tafl (while being a completely different game). Many thanks for taking the time to stop by and post a comment. I appreciate it. Be sure to check back!